For Samsung all series: Samsung Galaxy S7 S8 S9 Edge +, Samsung Note Series, Samsung Tab. Models not work: Huawei Mate pro 10, Huawei Porsche Notebook, HP spec 360 series, Lenovo Yoga Series. BOBWOWS Active Stylus offers a Pen-on-Paper writing experience on most major brand touch screen smart phone, tablet pcs,Touchscreen devices on iOS/Android/Windows Systems. BOBWOWS Stylus can do ideal writing,drawing,electronic signature,doodling,notetaking,studying in casual time, meetings, classes and other accasions when needed. For optimal performance, please ensure your device's screen protctor below 0.3mm. For iPad Pro 10.5/12.9 inch, suggest without screen protector when using, or it may not work or result in bad writing experience. Adjustable Fine Point: The latest 1.9mm fine tip makes the handwriting/drawing experience on smart phones & tablets & touchscreen notebooks much more accurate and precise.With the adjustable fine tip, you can adjust the tip length to adapt most touch screen devices to offer a seamless pen on paper writing experience. Wide Range Compatibility: iPad 1 2 3 4;iPad Mini 1 2 3 4;iPad Air 1 2;iPhone 5/5S/5C;iPhone 6/6S Plus;iPhone 7/7 Plus;iPhone 8/8Plus;iPhone X;iPad Pro 9.7;iPad Pro 10.5/12.9(withtouch screen protector,if install tempered film,it may not write); All Samsung Smart Phones,Notes,Tab Series; Touchscreen Notebooks: Asus/Dell/Surface Series; Other Brand: Sony,Sharp,Huawei,Xiaomi,ZTE,Vivo smart phones,tablets etc. Charging & Working: Built-in rechargeable battery with 30mins charging time offering 8 to 12 hours continous working time, 0.25s short press power button for switch on/off; The stylus shuts off in 5 mins if there is no activity to save battery. Easy to Use: No bluetooth not sofatware needed, simply power on the button, it works right away.Support major famous Apps: ZoomNotes, Evernote, Paper by FiftyThree, ProCreate,Bamboo etc. 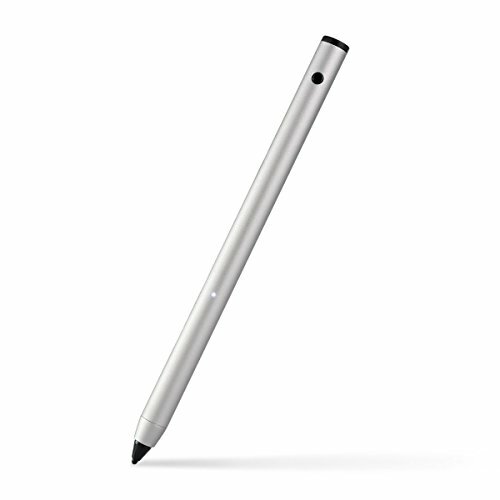 What's in included: 1 x Fine Tip Active Stylus. 12 Months Warranty.Hassle-Free Customer Service! If you have any questions about this product by BOBWOWS, contact us by completing and submitting the form below. If you are looking for a specif part number, please include it with your message.